Somewhere in Artesia Friday, a monkey was running loose. And the backs of the Bulldog football team were lighter for it. 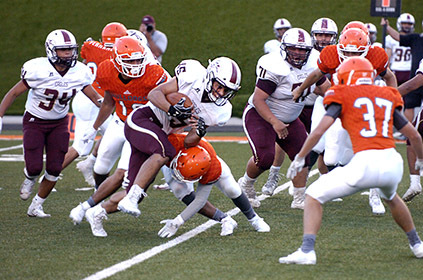 Two weeks of frustrating, fourth-quarter losses and pundits paining over discovering when Artesia last started a season 0-2 came to a gratifying end before a slightly-damp-but-enthusiastic crowd at Bulldog Bowl, as the boys in orange picked up their first win of the 2018 season over a significant opponent. Not only had Artesia last squared off with Belen in the 2017 state championship game, the Eagles were 2-0 coming into Friday’s bout, ranked second in the class in the New Mexico Overtime Sports Center’s coaches’ poll, third in the MaxPreps ratings. But when all was said and done, the Bulldogs headed up the ramp 1-0 against Class 5A opponents, a 28-14 victory under their belts. The ‘Dogs headed into the bout facing what would be hefty adversity for many programs, having lost a few starters – including their quarterback – last week in Hobbs. It was understandable, therefore, that the offense got off to a bit of a disjointed start, thwarted in their first two possession of the night. 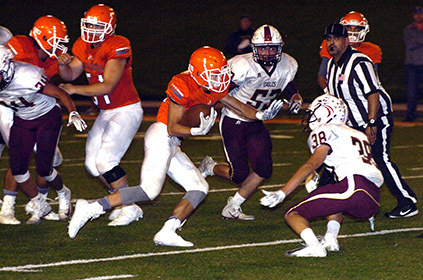 Artesia’s inaugural drive ended in a three-and-out, but their second was more frustrating still when, after starting fresh with a first down at the Belen 27-yard line after the Eagles muffed the punt, the ‘Dogs could not breach the end zone, settling for a 27-yard field-goal attempt that sailed wide left. The Orange Crush defense, however, was bending occasionally but not breaking versus Belen’s three-yards-and-a-cloud-of-dust attack. The Bulldog D sent the Eagles off the field with a three-and-out in their first series, a turnover on downs in the red zone in their second when linebacker Zach Ingram broke up a Luke Aragon pass on fourth down from the Artesia 21, and a fumbled punt snap in their own territory as the second quarter commenced. This time, the ‘Dogs’ offense didn’t look a gift horse in the mouth, needing just four plays to score from the Eagle 35 on a 21-yard scamper by senior running back Jagger Donaghe at the 9:46 mark. Belen would finally find some running room for star back Diego Casillas in their ensuing series, however, marching from their own 31 to a first and goal at the six, from whence Casillas took it in to tie the game – and earn his 100th rushing yard – with just under six minutes to go in the half. The Bulldogs went immediately back to work, alternating runs by Donaghe and junior quarterback Clay Houghtaling with passes from the latter to AJ Estrada and JR Bustamante en route to the Belen 15. From there, Houghtaling found Erik Cueto to put Artesia back in the lead – despite a botched PAT snap – 13-7 with two minutes left on the clock. As it turned out, that would be plenty of time for another trip to the checkerboard, as – after forcing a quick Eagle punt – Bustamante returned the ball to the Belen 26 before catching a 16-yard pass from Houghtaling to give Artesia first and goal at the 10. Alex Fernandez took the scoring pass this time around, and a successful conversion from Houghtaling to Donaghe gave the ‘Dogs a 21-7 advantage at the break. 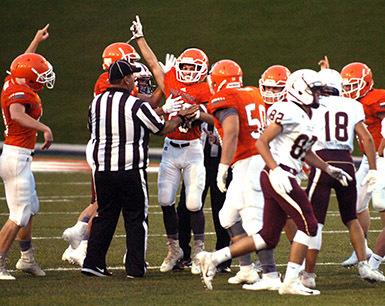 The third quarter was a frustrating one for Artesia overall, as the previously inconspicuous officiating crew began launching holding flags their way. Two in particular were tossed after the Bulldogs achieved a first down at the Belen 25, and the long drive ultimately ended in a turnover on downs. The Eagles, meanwhile, proceeded to commence a marathon drive that saw Casillas carry the ball 10 times – and the game into the fourth quarter – before scoring from the three to cut Artesia’s lead to seven, 21-14. When the ‘Dogs’ first series of the final 12 minutes ended in a goal-line stand – although Houghtaling appeared to be well over the line on second down from the two – the door was left slightly ajar, but the Crush essentially slammed it by forcing a Belen TOD at the Eagle 13-yard line. Artesia had a minor scare on first and goal when Belen was able to strip the ball away from Donaghe, but the whistle had blown on forward progress, placing the ball back at the three. Donaghe did the job from there to round out the final, 28-14. With 1:12 remaining, the Eagles followed a pair of short runs by Aragon with two desperation passes, but both fell incomplete to end the game. The Crush held the Eagles to 232 total yards on the night, 193 rushing and 39 passing. After giving up 145 yards in the opening half – 110 to Casillas alone – the Bulldog D got stingier in the final quarters, allowing just 87 yards. 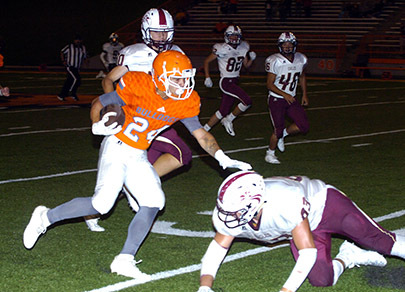 Artesia showed improvement in special teams Friday over Week Two in Hobbs, and on offense, the ‘Dogs finished with 274 yards, 112 by ground, 162 by air. Houghtaling was 20 of 32 for 162 yards and two touchdowns in his first varsity start, with Bustamante catching nine of those passes for 69 yards and Estrada four for 37. Donaghe went 22 of 94 rushing with two touchdowns. “Special teams play was better this week,” Henderson said. “We were more consistent in our assignments, and offensively, once we kind of got adjusted to the new quarterback, I think after the first quarter we settled in and were more consistent. The Bulldogs (1-2) will now prepare to host Deming in the 2018 Homecoming game Friday at the Bowl. The Wildcats are currently 1-1-1 with an 18-12 opening win over Gadsden, a 14-14, weather-forced tie with Santa Fe Capital, and a 28-16 loss to Goddard Friday. They’ll be looking not only for another win over a same-class opponent but to continue to see strides as they work their way past a rocky start and into the meat of their season. “Not that you want to go 1-2 to start the season, but if you’re going to, getting the win over a 5A team is a big one,” said Henderson. “Belen plays a good schedule. They’re going to play some other good teams in our class, and so are we, but I think not only does it help if you take care of business like you should come seeding time, it also helps with the confidence in knowing you’ve got that separation with people in your class.